Shiny Balls Mirror | OhGizmo! By Evan Ackerman on 02/20/07 • Leave a comment! Nope, the headline isn’t some sort of witty euphemism. 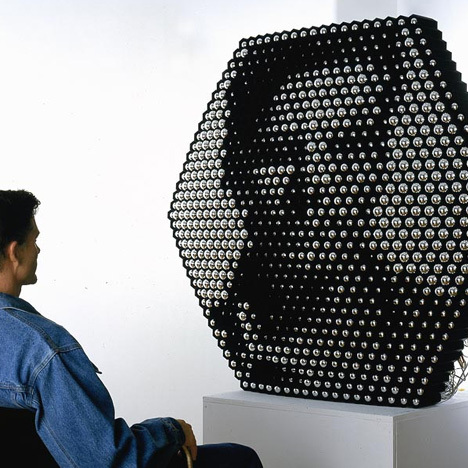 This is a digital mirror made out of 921 chrome painted ping pong balls nesting inside black aluminum tubes, by artist Daniel Rozin. Effectively, each ball and tube is a pixel. A camera in the center of the ball array watches what’s going on in front of the mirror, and little motors behind the ping pong balls move them in and out of tubes depending on the brightness that each ball represents. It’s quite a dynamic effect, especially with the creepy slithering noise of all those balls moving around. Daniel Rozin also designed this wooden mirror. The Shiny Balls Mirror doesn’t seem to be for sale, and even if it was, you couldn’t afford it.